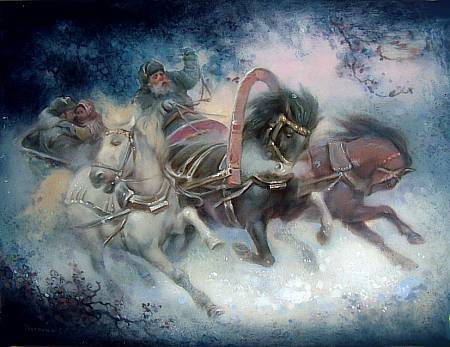 The furious energy of a troika racing through the wintry countryside can be felt in this dynamic giclee print, taken from a lacquer box composition by Fedoskino artist Potekhin. (To see the original lacquer box click here. The print is matted and will easily fit into a 16" x 20" frame of your choice, available at any arts and crafts store, or other department store. We have put included the image below below to give you some idea how it might look like with a frame. Limited quantity, so get one for your wall while they are still available. 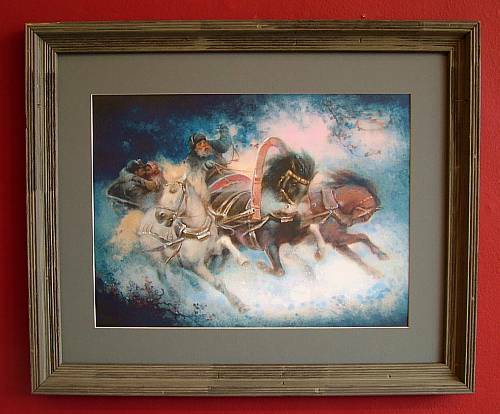 Enjoy the spirit of Russia with this exciting print!